For photos, more things to do, maps, and other tourist information, read our Ho Chi Minh City holiday planner. Auckland, New Zealand to Ho Chi Minh City is an approximately 11.5-hour flight. You can also do a combination of bus and flight. You'll gain 5 hours traveling from Auckland to Ho Chi Minh City due to the time zone difference. Traveling from Auckland in October, expect nights in Ho Chi Minh City to be somewhat warmer, around 28°C, while days are much hotter, around 38°C. Finish your sightseeing early on the 6th (Sun) to allow enough time to travel to Bangkok. 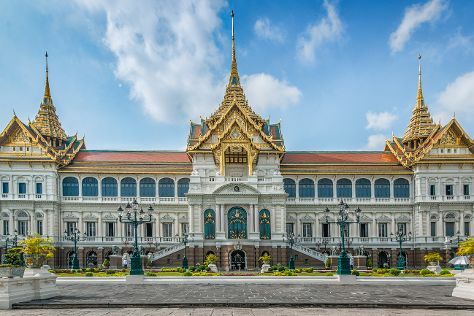 On the 7th (Mon), step into the grandiose world of The Grand Palace, then delve into the distant past at Wat Pho, and then take in the spiritual surroundings of Temple of Dawn (Wat Arun). To find where to stay, photos, and more tourist information, read Bangkok trip itinerary tool . Traveling by flight from Ho Chi Minh City to Bangkok takes 4.5 hours. Alternatively, you can drive; or take a bus. In October, daily temperatures in Bangkok can reach 38°C, while at night they dip to 29°C. Finish your sightseeing early on the 7th (Mon) so you can travel to Singapore. Kick off your visit on the 8th (Tue): examine the collection at Buddha Tooth Relic Temple and Museum, pause for some photo ops at Merlion Park, and then learn about wildlife with up-close encounters at Singapore Zoo. Here are some ideas for day two: walk around Singapore Botanic Gardens, don't miss a visit to Singapore Flyer, and then admire the natural beauty at Gardens by the Bay. To find traveler tips, other places to visit, and tourist information, you can read our Singapore tour planner . You can fly from Bangkok to Singapore in 6 hours. Other options are to do a combination of flight and bus; or drive. Due to the time zone difference, you'll lose 1 hour traveling from Bangkok to Singapore. In October, daily temperatures in Singapore can reach 38°C, while at night they dip to 30°C. Wrap up your sightseeing on the 9th (Wed) early enough to travel back home.